Collegewood Elementary hosted a 50th birthday spectacular on March 20. “Our school was built in 1965!” announced fourth grader Sarah Armstrong on her way to the party held on the upper playground. 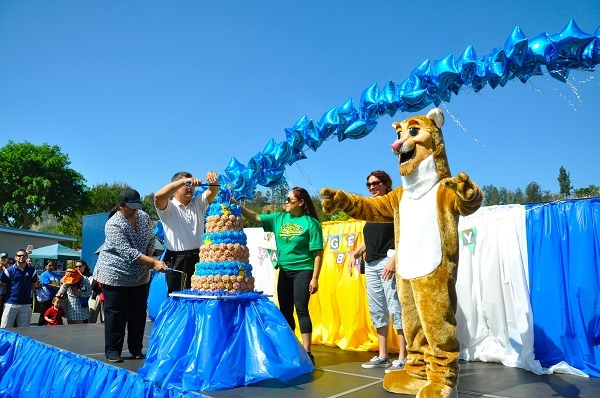 The school’s 600 students and staff couldn’t wait for the big day. “We made birthday cards, hats, and decorated lunch bags for the hotdog picnic,” said 3rd grader Emily Yem. Parent volunteers prepared 1,000 cupcakes and 1,200 hotdogs for the party. “This is a very exciting day for Collegewood, we are ready to celebrate!” 2ndgrade teacher Elvonne Vance exclaimed. 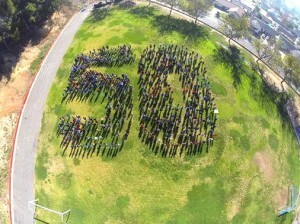 Earlier in the week, students and staff posed in a huge “50” for an aerial photo. Parents, alumni, former teachers, community members, and local officials joined the milestone occasion. “Everyone who has been a part of this school has left a little bit of magic which has shaped who we are today!” Principal Joan Perez stated. The event featured special music by the Collegewood choir, Walnut High Band Buddies, school trivia contest, and time capsule dedication. Birthday hat contest winners from each class deposited keepsakes including photos, student writing, books, toys, and list of current technology. Three of the school’s former principals Jack LeBrun, Dr. Susan Brown, and Robert Chang were on hand for the celebration. “Collegewood has always had a great hard-working group of teachers and staff who really dedicate themselves to the students,” said LeBrun, the school leader from 1985-1992. Several original alumni shared their memories from 1965. “It was wonderful! We were excited to be in a brand new school,” shared Carol (Paine) Crouch, who was in the 3rd grade when the school opened. “I lived on Collegewood Drive, so when the school was being built the neighborhood children weren’t happy they would lose their playground. We did lots of climbing in these hills!” Crouch added. First grade teacher Jane (Dyer) Smith is the school’s most familiar alumnus. She’s taught at Collegewood for the past 28 years. “I was in the third grade with a very special teacher named Janey Browning. I can still remember the day that we moved into our brand new school. The classrooms seemed so big to us!” she said. Students began the school year at the former location of Walnut Elementary, now Ron Hockwalt Academies, and then moved to Collegewood when it was completed. “I remember walking on the hiking trails above the playground and we would have lunch under the trees. And since we were the first students we got to vote for the school colors and mascot!” Smith told students. Smith acknowledged former teachers Eleanor Larks, 5th grade and Gene Garno, 6th grade, in the audience. “I had lots of fun and remember we did square-dancing and special field trips,” recalled City of Walnut Mayor and alum Nancy Tragarz during a tree dedication at the party. Ray and Nancy Fausel’s five children attended the new school and they wouldn’t have missed the big party. He was one of the District’s original Board Members from 1964-1969, serving both the Walnut Elementary District and Walnut Valley Unified School District. “Happy Birthday Collegewood – I think you’re great!” Nancy lauded. After the ceremony, families enjoyed a picnic lunch and birthday cake. 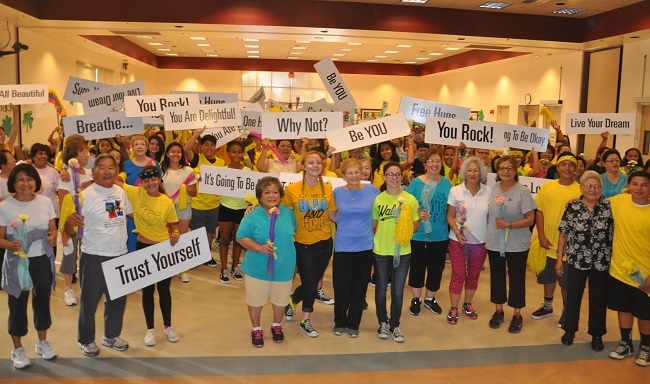 Suzanne students sprinkled Walnut seniors with flowers, positive messages and hugs. Suzanne Middle School students brought a whole lot of sunshine to parents, local seniors, and fellow classmates on March 18. Drama, PALS, and PLUS leadership members sprinkled happiness throughout the day. The group of 80 students wore bright yellow shirts and big smiles as they greeted parents during the morning drop off. They carried happiness signs with positive messages like You are Loved, Breathe, and It’s Going to be All Right. “Our kids were standing in the parking lot and street corners just wishing everybody a great day,” said math and drama teacher Helen Papadopoulos. The Happiness Project, created by Laura Lavigne, founder of the Anacortes Center for Happiness is a simple way to share a powerful message. People that were sprinkled might have been surprised at first, but the happiness spread quickly. They smiled, waved back, and some even honked. “We get to spread happiness all over!” exclaimed eighth grader Samantha Stone. “We saw so many amazing parents driving by and smiling as they left the parking lot. So we feel like we did our job!” Papadopoulos added. Later in the morning, the group trekked over to the Walnut Senior Center to make a surprise delivery of flowers, hugs, and smiles. The kids continued waving their yellow pompoms and signs at passing cars while they walked down La Puente Blvd. When they arrived, they mingled through a morning senior aerobics class sharing the gifts of happiness. Seventh grader Mary Danganan made a beeline right over to Darlene Knox. “I think it’s wonderful!” exclaimed the surprised retired educator clutching the colorful stems. “We just wanted to spread love and happiness. And it’s fun!” Danganan gushed after giving a heartfelt hug. Masa Nishida, a 35-year-resident, said he was brought to tears with the special gesture. “It’s great!” he beamed. “The seniors just loved the flowers from the kids,” commented Recreation Supervisor Gabriela Encinas. “It was really fun to see them smile,” said 8th grader Priscilla Pranajasa after visiting the senior center. At lunch, the happiness sprinkling continued. Random notes of kindness were passed out to students that said “You Matter, Sure You Can, Imagine, and You Can Do It. “It’s Pass It On Week, so week so we’ve been spreading happiness!’ Pranajasa said. “Today is about changing just one life at a time!” added teacher and leadership advisor Marla Rickard. Rickard wants students to see the impact of sharing a smile or kind word. 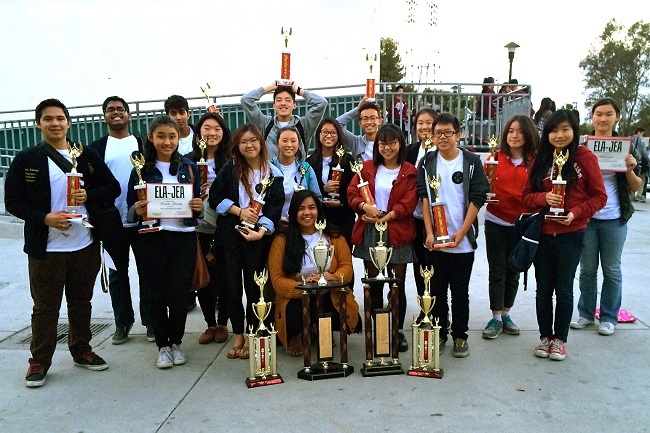 Walnut High School Publications garnered the Super Sweepstakes award for the third time in four years at the Eastern Los Angeles Journalism Education Association (ELAJEA) Write-offs Competition on Saturday, February 28. The competition featured various categories of writing, photography, and yearbook design, and copy writing. One yearbook team captured the 1st Place Yearbook Sweepstakes trophy while individual awards helped Walnut pick up a 3rd Place Newspaper sweepstakes trophy and 2nd Place Novice News sweepstakes trophy. Walnut Valley schools swept all 1st Place sweepstakes trophies at the tourney, with Diamond Bar High School celebrating a 1st Place Newspaper Sweepstakes and 1st Place Novice News Sweepstakes victory. Yearbook Layout: 1st Place – Crystal Chang, Aaron Yong, Yolanda Yu, Laura Zhang; Yearbook Layout: 3rd Place – Jezebel Cardenas, Emily Chen, Jessica Lee, Cynthia Lu; Yearbook Copy: 1st Place – Crystal Chang, Aaron Yong, Yolanda Yu, Laura Zhang; Yearbook Copy: 3rd Place – Jezebel Cardenas, Emily Chen, Jessica Lee, Cynthia Lu. News Photography: 2nd Place – Andraes Arteaga; News Photography: 3rdPlace – Elaine Liu; Feature Photography: 4th Place – Sajid Iqbal; Critical Review: 1st Place – Lisa Shen; Critical Review: 2nd Place – Nikita Patel;Editorial Cartooning: 3rd Place – Gabrielle Manuit; Novice News: 8thPlace – Brian Wu. News Writing: 6th Place – Brandon Ng; Sports Writing: – 1st Place – Ted Zhu; Feature Writing: 1st Place – Alison Chang; Feature Writing: 10thPlace – Spencer Wu; Editorial Writing: 1st Place – Michelle Chang. 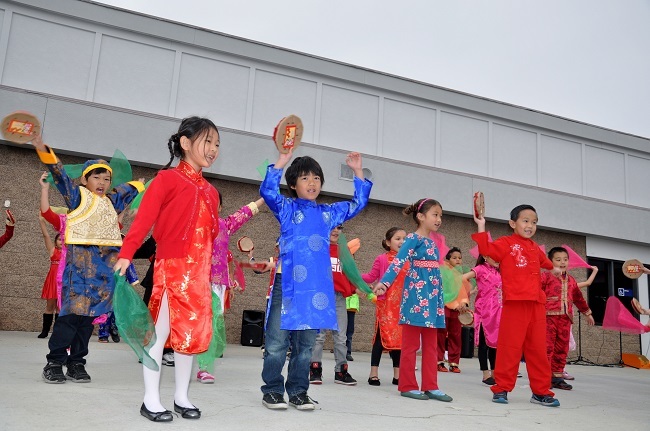 Nearly 200 Dual Language Immersion students in kindergarten through 3rd grades celebrated Lunar New Year by performing for their parents and families at Walnut Elementary. Mandarin songs, ribbon dances, and even a play explaining how the animals were chosen to be part of the 12 signs of the Chinese Zodiac were performed. The dress rehearsal on Thursday was equally as meaningful as all 560 students sang in Mandarin for the finale. This Lunar New Year celebration would not be possible without the hard work of the Dual Language Immersion teachers: Carol Cheng, Jeannie Lin, Henry Lin, Krystin Wong, Connie Shiroishi, Amy Wu, Connie Chen, and Vivian Ramirez. In addition, parents assisted in costume and prop preparation. 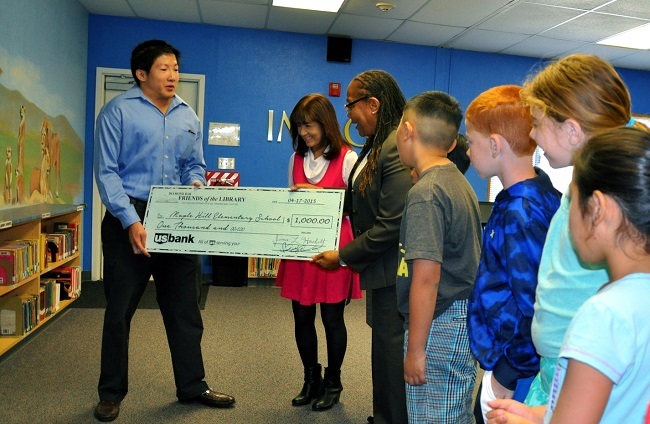 “Dual Language Immersion is one strand of world language education at Walnut Elementary,” Principal Janet Green said. Students in grades 3-5 are enrolled in the online Middlebury Interactive Language program and may choose among Spanish, French, and Chinese. Every teacher on campus provides global education through the Units of Study, which reflect Common Core standards. 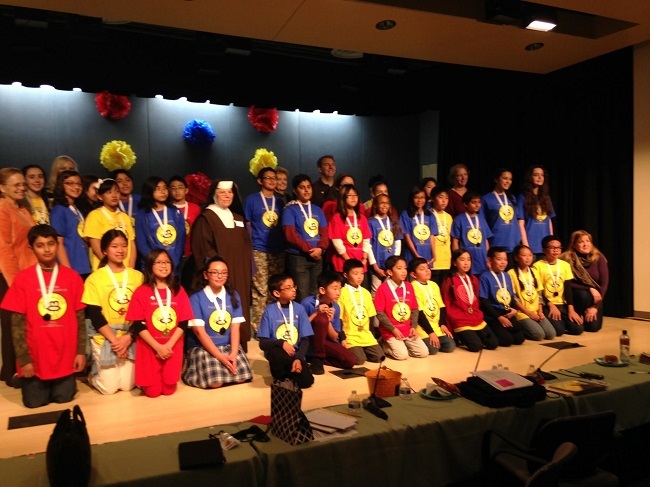 Walnut Elementary is truly a neighborhood school with a global perspective! 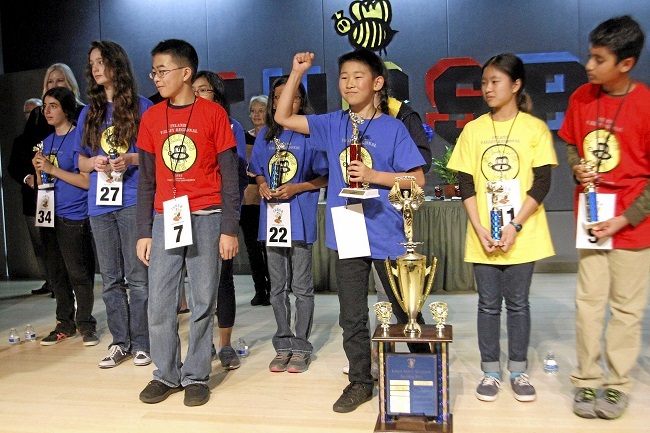 Congratulations to the 34 spellers who qualified for the Inland Valley Regional Spelling Bee Finals this Saturday at Mt. SAC. Good Luck! 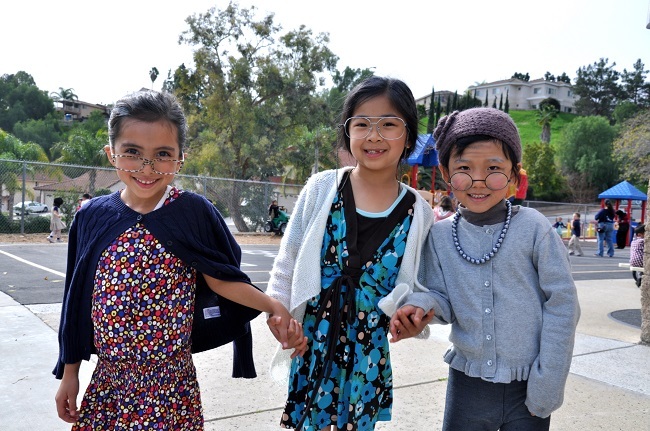 Kindergarteners Rachel Peiten, Chloe Thi, and Molly Chung showed off their 100-year-old costumes. C.J. Morris Elementary kindergarten students dressed up as adorable centenarians to mark the 100th day of school on January 28. The youngsters transformed into 100-year-olds with gray spray-painted hair, glasses, and canes for the day of fun and learning. Many of the little ones had their new “mature” hair tucked up in buns with rouge on their cheeks. They wore aprons, shawls and sweater vests. Some even had painted-on wrinkles! Chloe Thi, age 6, said she liked wobble-walking with her little cane. “This was the first time we’ve had the students dress as old people,” noted teacher Sarah Sherman. 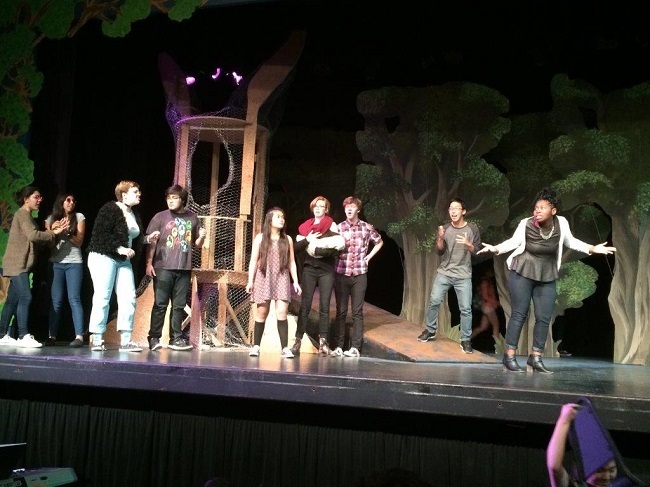 The teaching team includes Luisa Salazar, and Kelly Revells, and Sherman, who led the activities costumed with gray wigs, floral dresses, saggy socks, and a trio of canes. “Mrs. Salazar looks like an old lady! She’s wearing a wig,” observed a giggling Jewelina Baker. Counting to the 100th day of school serves as good practice for number recognition and beginning math skills. It’s also the means students and their teachers made it about halfway through the school year! The kids look forward to reaching the big 100 all year long. They counted out 100 Fruit Loops cereal rounds to make necklaces. They estimated walking a-hundred feet. They wrote little books about 100 things they’ve seen, eaten, or wanted to do. At recess the young whippersnappers raced and played. “We were two old ladies riding a race car!” exclaimed Rachel Peiten.